So, when asked by Architect magazine to review the new BLDG BLOG Book, I felt kinship with Manaugh's many "enthusiasms" and wanted to see how they'd (underground cities, musical icebergs, fantasy weather, etc.) hold up in quality paperback. You can read the whole review at Architect, but here's a few grafs. It is hard to say if the new texts make the book anymore book-like. It still feels very bloggy, minus the hyperlinks and comments. (Actually, links would help, in just a few pages I chalked up references to works by Umberto Eco, Neil Gaiman, Francis Ford Coppola and Orson Welles. The extensive name checking is borderline High Fidelity, i.e. record store clerk insiderness.) In each short essay, Manaugh lets his consciousness expand. For instance, in a piece entitled The Weather Bowl, he proposes manipulating the climate to create public events and fun spectacles. Letting his narrative get frothy, he writes, “Weather control is the future of urban design. Engineering the climate is how we’ll make our cities interesting again.” Interesting. Like how Katrina made New Orleans interesting again? Is Manaugh critiquing the political gap between climate change and urban infrastructure with a sly parody? We’ll never know; he finishes by imagining a new Pritzker Prize for Best Weather Effects. When ripening, bananas don’t really smell like bananas. Instead they have an elusive, heady, ozone smell. (Maybe it’s the smell of ethylene—bananas have a higher concentration of that gas than other, rounder, fruits.) I mention this, not as a gratuitous phallic food reference, but because it explains why I didn’t realize that the new Stefan Sagmeister exhibition, Things I Have Learned In My Life So Far, contained a wall of the elongated, green, yellowing, soon-to-be-brown-and-attracting-fruit-flies, produce. After walking past the reception desk at Deitch Projects, and checking out the title work, Things I Have Learned In My Life So Far, an installation of blank note pads waiting to be filled, I headed into the larger gallery. 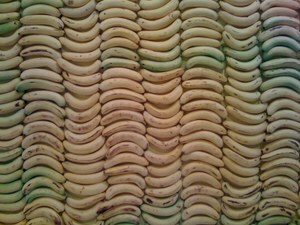 My nose picked up the sweet, chemical odor before my gaze traveled over to the 10,000 bananas. 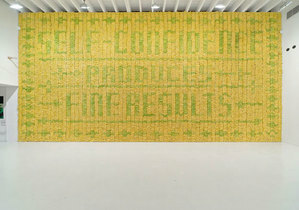 The piece, Self-confidence Produces Fine Results, spells out those words in green and yellow fruit: The sampler slogan, already obscured, as the unripe font turned golden in the warm room. The things the graphic designer has learned in his life so far are simple truisms done up in quirky drag, but I’ve always liked this growing collection. Sagmeister transforms near-clichés into aphorisms that tap into how a creative mind works. 43 folders has the entire list here. Picking a favorite is tough. Today it is “Having guts always works out for me.” I am not sure it always holds true, but it is something to live up to. I’ll abide by the banana billboard as well. Self-portrait with frost and terrazzo. Over at varnelis.net, Kazys posts about his William Gibson mini-obsession—in light of the recently released Spook County. The enthusiasm is infectious, and I’ve allowed it to lead me to Gibson’s 2003 novel, Pattern Recognition. Forty pages in, the novel makes me jittery, filled as it is with jet lag and brand name anxieties. The details overwhelm: catalogs of cool desires and detachments. It stirs up memories of a year where, coolhunter adjacent, I worried if my jeans were a dark enough hue. Soon after I switched to corduroy. Brutally cropped, he regards her from the depths of massive, mask-like Italian spectacles. The black-framed glasses remind her of emoticons, those snippets of playschool emotional code cobbled up from keyboard symbols to produce sideways cartoon faces. You could do his glasses with an eight, hyphen for his nose, the mouth a left slash. 8-\. The international symbol for dork. Cool be damned.